Who doesn't love giving their dogs and cats cheese? With Rewards™, we’ve made cheese treats even better. Our ingredients start with grass-fed, organically-raised, truly raw goat cheese, resulting in a uniquely delicious and healthy twist. These treats are teeming with protein, healthy fats, and beneficial bacteria. 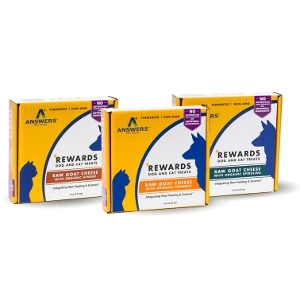 They're so good, they’re sure to fool your four-legged best friend into thinking they got away with something.